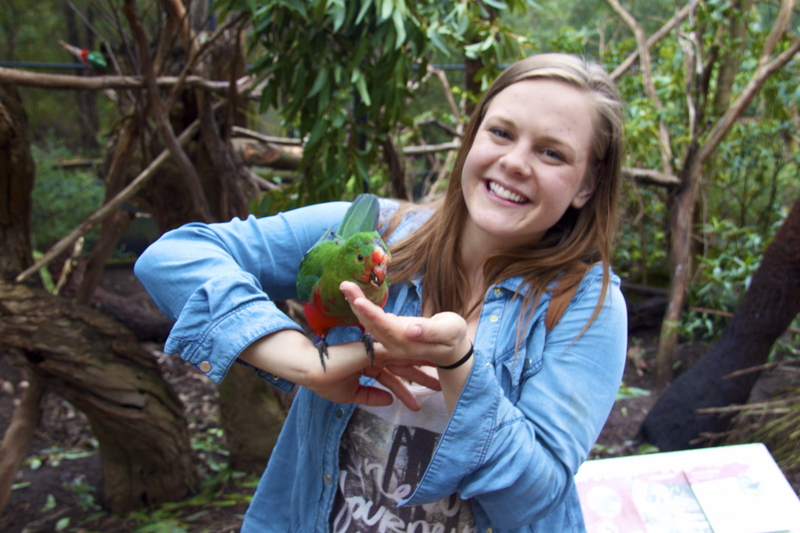 Animal encounters have been one of my favorite parts of Australia so far, and one of the best places I’ve been has been the Healesville Sanctuary. Healesville is located an hour to an hour and a half outside of Melbourne, and is host to a number of different indigenous species, including kangaroos, wombats, wallabies, Tasmanian devils, echidnas, koalas, platypuses, birds and dingoes. The sanctuary offers “encounters” with the animals, which vary by price based on species. 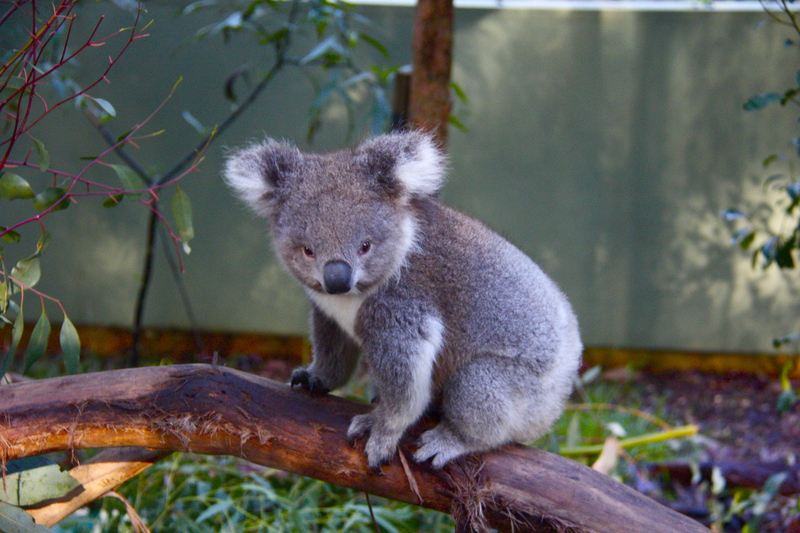 Some offers, such as the kangaroos, are free and open-air, while the price for dingoes is $12, the price for wombats is $20, and the price for a platypus encounter is upwards of $180. Cheyenne and I booked our encounters when we arrived at the sanctuary around 11 am, and managed to snag spots on a 12 pm wombat encounter and a 2:15 pm dingo encounter. We stopped by the kangaroo enclose to kill some time before heading to the wombats and were fortunate enough to be alone and some of the roos first visitors. A few were extra curious and friendly, and thought that I would make an awesome cuddle buddy and/or source of food, and they came up and nuzzled me without any coaxing. We returned to the roos later on in the day, but they were much more aloof and didn’t seem to want to approach anyone. After the roos we walked through the platypus enclosure and ogled the Tassie devils for a few minutes before waiting outside the wombats enclosure for our encounter. Healesville had a professional photographer taking photos of us, but we were also allowed to bring in our own cameras and get a few snaps. Our wombat of choice was called Bob, a 15 month old adolescent wombat who had been orphaned when he was young. Wombats are only cuddly for a short period of time in their youths, and Bob was in his last few months of being young enough to interact with before he became too large and too aggressive to love on any longer. We were given a few minutes each to hold and snuggle him, and his caretaker informed us that the wombats like to be rocked like babies as it reminds them of being in their mothers pouches as younglings. 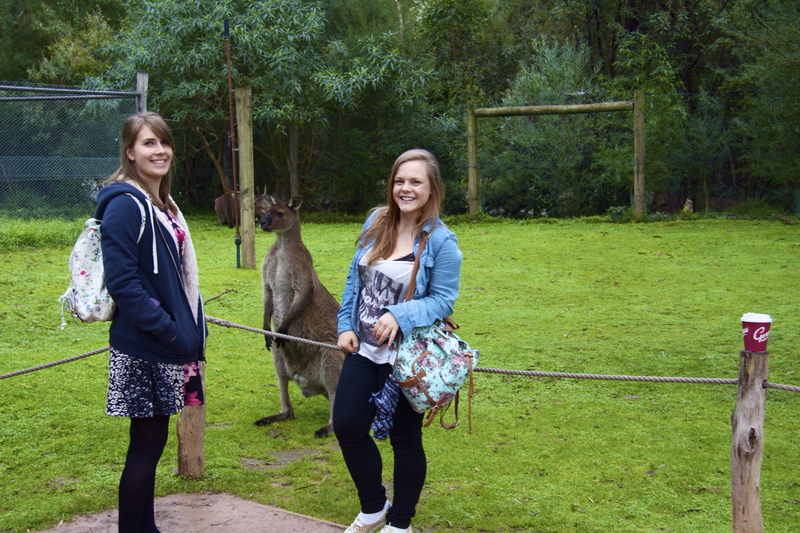 After fifteen minutes we said our sad goodbyes to Bob and moved on, touring the wallaby enclosure and the numerous bird enclosures. At the bird enclosures we were able to feed some of the birds, the first group of which were a little bit disinterested but cooperated for photos all the same. The second group of birds were significantly hungrier and swarmed us when we were given their food. At one point I’m pretty sure I had six or seven needy, frantic birds on me at once, which was uncomfortable but apparently hilarious enough for strangers to take photos of. The sanctuary also offered a birds of prey show at 2:15, where they speak about some of their resident birds, tell an audience about each species’ quirks and tendencies, and then exhibited some structured behaviors unique to each bird. Our last encounter of the day was the dingo encounter, where we met two semi-friendly and very treat-eager dingoes. We were in a group of six or so, with two very small children who maybe should have waited a little bit longer before coming to see the dingoes. The staff were very specific and strict about where, how and when the dingoes could be petted, and the younger children weren’t really capable of following the instructions or didn’t understand why the rules were in place. The dingo encounter was still pretty good, but if doing a visit to the sanctuary I would definitely recommend some of the other encounters first. 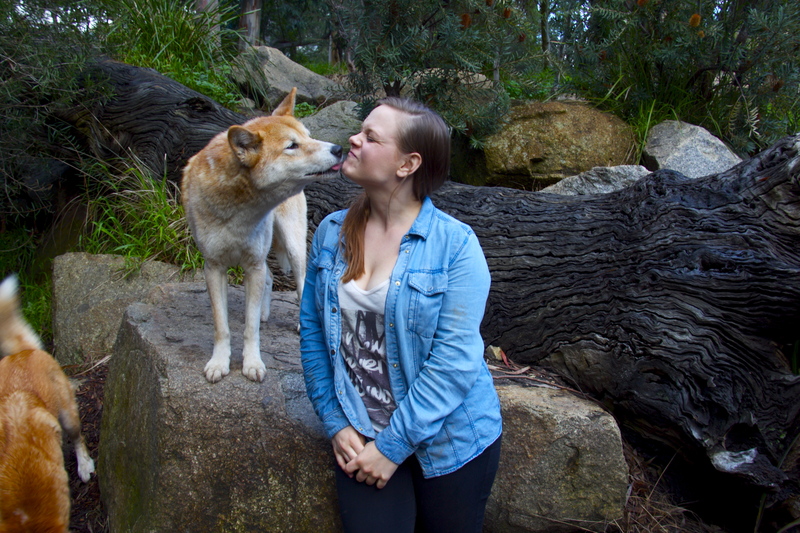 The dingoes were pretty friendly, and even offered a little kiss on the way out! The sanctuary also has a nifty little café, which offers gluten free and vegetarian foods. It can be a little pricey, but was generally pretty tasty and a nice way to end the day. 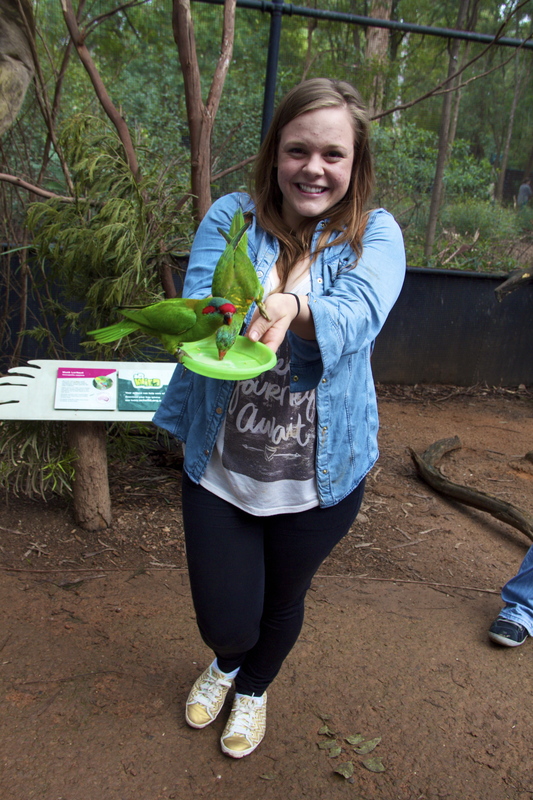 If you’re planning a trip to Australia, I would most definitely suggest adding Healesville Sanctuary to your list! 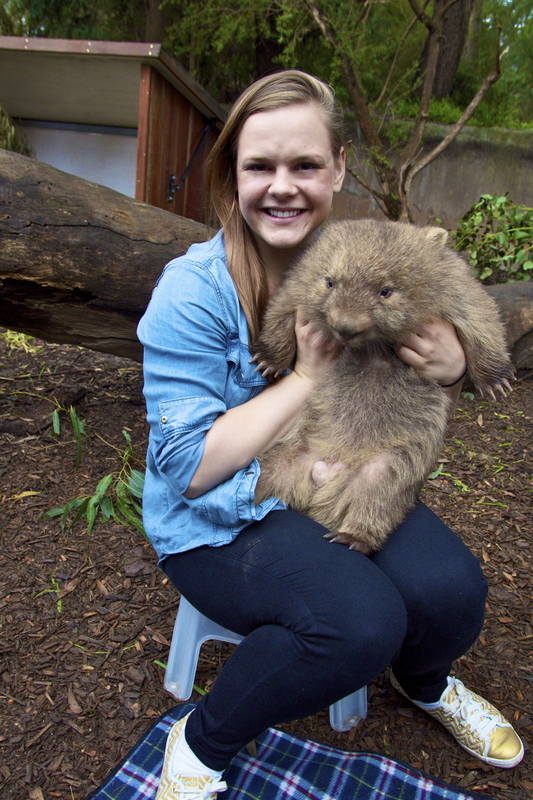 Previous Post Holding a Wombat at the Healesville Animal Sanctuary near Melbourne, Australia!